The Speaker of the House of Commons condemned publicly today a "racial profiling" incident involving a group of black visitors to Parliament Hill — and said an apology isn't going to be good enough. 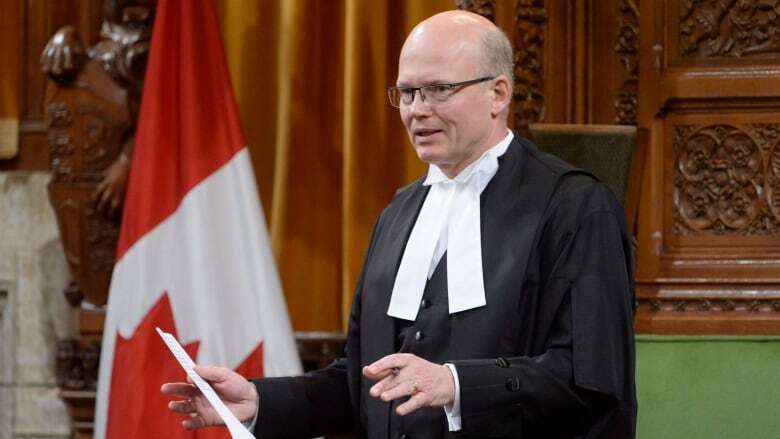 The Speaker of the House of Commons today condemned publicly a "racial profiling" incident involving a group of black visitors to Parliament Hill. The incident happened on Feb. 4, when a coalition of black, human rights, labour and youth groups were attending the Black Voices on the Hill Day. About 150 members took part in meetings with eight cabinet ministers. The visitors later reported that a government employee had complained to the Parliamentary Protective Service (PPS) about them, taking their picture and referring to them as "dark-skinned people." The group alleged a member of the PPS who responded to the employee's complaint used the term "dark-skinned" and told them to leave the cafeteria, even though they had valid passes allowing them to be there. "The racial profiling incident cannot be condoned and must be dealt with swiftly and purposefully," said Speaker Geoff Regan in a statement delivered in the House today. The PPS issued an apology and launched an internal investigation of the incident, insisting it has "zero tolerance" for any type of discrimination. "The apology is a welcome first step; however, it should not be construed as either a final step or a way to erase the harsh and unacceptable reality of what happened," he said. "Instead, we are resolved to learn from it and to do better going forward. While one transgression does not represent the actions of all, one is too many and none can be overlooked, dismissed, or excused." Regan went on to say that everyone who visits Parliament Hill must know "unequivocally" that they will be treated with dignity and respect. "To experience anything less here on Parliament Hill, the centre of our democracy, is a failure on our part and for that I offer my sincere apologies. We can and must do better, and we will," he said. Regan's statement was in response to a question of privilege by Liberal MP Greg Fergus. The Speaker ruled that it did not constitute a question of privilege because it did not involve a member of Parliament or a proceeding in the House or a committee, but he said the incident was grave enough to warrant a strong rebuke. At the time, the coalition expressed interest in a meeting with Prime Minister Justin Trudeau to discuss systemic issues of racism, but a spokesperson from the Federation of Black Canadians told CBC News that to date, the PMO has not been in contact to request a meeting. "We are not aware of any discipline and have not been contacted by the PPS," said Richard Picart in an email. PMO spokeswoman Chantal Gagnon noted that in his remarks to mark Black History Month, Trudeau said that "anti-black racism and unconscious bias are real" and that it's unacceptable to judge people or deny them opportunities because of the colour of their skin. Joseph Law, chief of staff to the director of the PPS, said the internal investigation has been completed. He would not offer specific details of the outcome, or say if disciplinary action has been taken. "Following this incident, we have taken steps to review our training and procedures to address any gaps in an effort to avoid a similar situation from re-occurring," he wrote in an email.